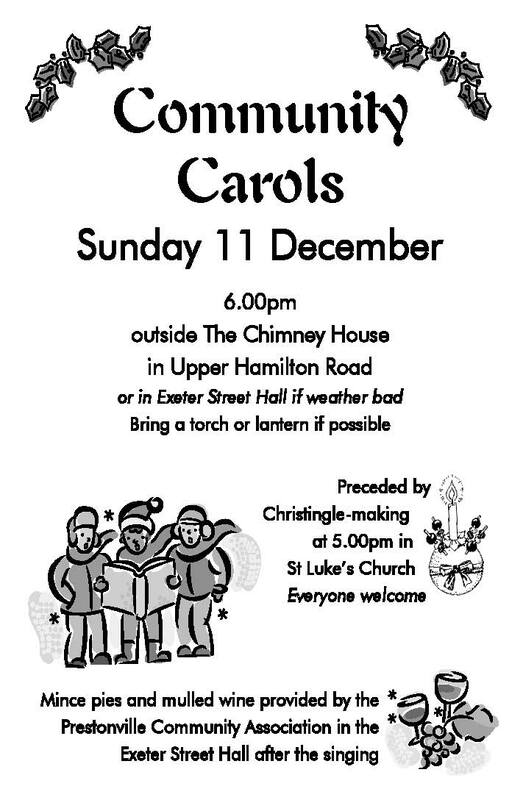 Everyone is welcome to join in the Community Carols at 6.00 Sunday 11 December outside The Chimney House (or in the Exeter Hall if raining), followed by mulled wine and mince pies in the Hall, provided by the PCA. A meeting between St. Luke’s Church and local people took place on Weds 7th December to discuss the proposed sale of Exeter Street hall. There has been strong support from residents to save the hall and over 400 signatures have been collected by volunteers in the surrounding streets. The encouraging news from the meeting is that an opportunity does exist for the hall to remain in use for the community but time is running out. We need your ideas, knowledge and contacts now. Ideas – How would you like to see the Hall developed? Knowledge – Do you have any experience of developing community buildings, or skills that could help us plan? Contacts – We could do with advice from a reliable builder, plus legal and planning advice. Do you know people who’ve done similar things? visiting the facebook page for our campaign to add your thoughts. coming along to the hall for a mince pie and mulled wine after the community carols on Sunday 11th Dec outside the Chimney House. Carols begin at 6pm. events – Community Picnic, Dog Show, Craft Fair – and from direct donations. a further 24 to follow. touch with Martin Baron via the Postblog contacts. planting of new roses when weather is deemed appropriate. And other events still at the planning stage. A petition to preserve Exeter St. Church Hall for community use. This petition is to support the preservation of St Luke’s Church Hall as a community building by upholding the current D1 Class use status in the event of its sale. Under the Use Classes Order 1987 (as amended) D1 includes: medical and health services, creche, day nursery, day centre, public halls, exhibition halls, art galleries, non-residential education and training centres, places of worship and church halls. We the undersigned, ask Brighton and Hove City Council to support the local residents in preserving the community use of this Church Hall in the heart of our neighbourhood. – We understand that the vicar of St. Luke’s Church, Martin Poole, would like the community use of the hall to continue but we are not clear about how this can be achieved. – Even if the D1 status is upheld initially, a developer could purchase the building and immediately close it to the Community. Within a year, the Brownies, the Youth Club, the playgroup, Zumba, the after school art club and all the children’s parties and clubs that are currently held there will have found new homes. At this point the developer will build a case around these facts and present it to the planning department with an application for change of status to allow for the building of flats/ houses. Is the Church willing to put a covenant into the deeds of the Church Hall to stop this from happening? – We have heard that a percentage of any future profits that are made by the initial purchaser of the Hall, from it’s resale, will go to the Church. Given that the Hall spans an area equivalent of four typical Exeter Street houses and it is not a listed building, is there anything in place to stop the building from being demolished? If not, would the vicar consider including this in the covenant? – Here’s some approximate sums: Purchase price £250 k + Demolition £30k + Build of four town houses £80k each (yes,that’s correct) = £630k. Sale of 4 new town houses, next to a Infant and Junior school and 10 min walk to station £1.8m + PROFIT £1,170,000. – There are instances where a developer has created a community space within a residential development as a means of negotiation. If this was on the table next to an offer that would create larger profits, which would the Church choose?